The high-resolution, digital cinema grade video projector alternately projects right-eye frames and left-eye frames, switching between them 144 times per second. The projector is either a Texas Instruments' Digital Light Processing device or Sony's reflective LCOS (liquid crystal on silicon). A push-pull electro-optical liquid crystal modulator called a ZScreen is placed immediately in front of the projector lens to alternately polarize each frame. It circularly polarizes the frames clockwise for the right eye and counter-clockwise for the left eye. The audience wears circularly polarized glasses that have oppositely polarized lenses that ensures each eye sees only its designated frame. In RealD Cinema, each frame is projected three times to reduce flicker, a system called triple flash. The source video is usually produced at 24 frames per second per eye (total 48 frames/s), which may result in subtle ghosting and stuttering on horizontal camera movements. A silver screen is used to maintain the light polarization upon reflection and to reduce reflection loss to counter some of the significant light loss due to polarization filter absorption. The result is a 3D picture that seems to extend behind and in front of the screen itself. 3D systems for movies using polarized light cause a significant (about 75%) loss of screen brightness due to the inherent filter absorption. Although the silver screen used in RealD Cinema is brighter than the standard white screen used for 2D projection, the ZScreen polarization filter in front of the projector blocks half of the projected light, then half of the light reflected by the silver screen is filtered away by the polarized glasses. This results in less than 25% of the projected light reaching the eyes of the viewer. Conversely, in a standard 2D system, the only significant cause of light loss is absorption by the white screen. RealD estimates the viewer sees about 35% of the light when viewing RealD 3D when compared to a similarly projected 2D image on a standard white screen. The overall effect is that of wearing a pair of slightly darkened glasses in a standard movie theater, which could be compensated for by using about 3 times brighter projector lamps if a 100% compensation is intended. These glasses cannot be used as sunglasses despite their dark tint because their effect on nearby radiation (e.g. UV and IR) can be somewhat different. This means they might not block such wavelengths at all. As a result, the 3D glasses might expose the retina of the eye to an even higher dose of potential harmful light components as compared to normal exposure to sunlight as the eye adjusts the width of its iris opening according to the parts it can detect. Such 3D glasses might have warnings on their packaging that they will not work as sunglasses. Some viewers of 3D movies complain of headaches or nausea during or after viewing. These problems can be caused by the viewer tilting their head, making it harder for the brain to fuse the two images (due to parallax mismatch between the eyes and the cameras). It can also be caused by rapid transitions in the movie between scenes of very different depth. Consequently, directors and editors of 3D movies should avoid such transitions. ↑ Verrier, Richard (2009-03-26). 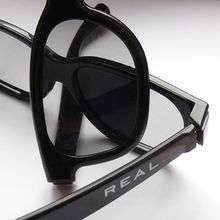 "3-D technology firm RealD has starring role at movie theaters". Los Angeles Times. Retrieved 2011-02-05. ↑ ""Jurassic World" In 3D Delivers Approximately 65% Of Universal Pictures Record-Breaking International Opening Weekend". RealD. Retrieved June 22, 2015. 1 2 3 4 Cowan, Matt. "Real D 3D Theatrical System" (PDF). European Digital Cinema Forum. Retrieved 2009-03-28. ↑ Cowan, Matt. "Presentations (technical)". RealD Media Room downloadable files. Retrieved 2009-03-28. ↑ Watt, Nick (2009-12-19). "Will 'Avatar' Make Viewers Nauseous? The 3D Effects in Blockbuster Movie 'Avatar' Are Claimed to Be 'Vomit Inducing'". ABC news. ↑ "How to avoid getting a 3D headache while watching Avatar". Shadowlocked. 2009-12-21. ↑ Needleman, Rafe (2009-06-18). "3D means new rules for directors".